Don was born in 1925 just outside of Scott. He has been a master mechanic, carpenter, electrician, welder, plumber, mason, blacksmith and schoolbus driver. He started learning most of what he knows from his father Jacques, who was only one year old when his own father, Pierre, died from wounds he received in a duel near Cankton. Pierre had come to Louisiana from France where he had apparently learned the craft of smithing. The ability to make things and fix them was passed along in the Montoucet family. Over the years, he has also become the premier maker of musical triangles in South Louisiana, reproducing the pattern of his grandfather’s original model with its characteristic double curls on the open ends. He is also one of South Louisiana’s great raconteurs, regularly regaling clients in his garage and friends around his barbecue pit with hilarious stories. Don is also an excellent accordion player. He is, as he often says, “a purebred musician;” both his father and his mother played the accordion. His father, in fact, was quite well known in the area for his music. Don points with great pride to a framed, notarized document certifying the results of an accordion contest that Jacques Montoucet won, defeating such immortals as Amede Breaux and Joe Falcon. Don grew up with the sound of an accordion in his ears. Even after the death of his father, Don’s mother continued to provide for his informal education as a musician. For years, he played only for his own enjoyment and for his family and friends at home, until being pressed into service with the Wandering Aces. When legendary Cajun musician Lawrence Walker died unexpectedly of a heart attack in 1973, the fiddle player in his band was Lionel Leleux. Despite a deep sense of loss, the group decided to play out its commitments before disbanding. Leleux asked his long-time friend Don to replace the late master for the last performances. Although Don protested that he had never performed in public, the group insisted on him as a replacement. He finally accepted their invitation with the firm understanding that they were only to complete the remaining commitments. Just before the first performance, Don was understandably ill at ease. He expressed his feelings of doubt and inadequacy to Leleux, who dismissed his friend’s concern, answering simply, “Oh don’t worry about a thing. Just do it like old Lawrence used to and everything will be just fine.” The advice must have had some effect, as the group went on to perform regularly for another year and a half. He eventually withdrew from the weekly dance hall circuit, but music continued to be an important part of his life. Don has taken the passage of tradition very seriously. He has had the opportunity to travel so many places in the United States, Canada and France representing the traditional Cajun music he first learned from his parents. At festivals such as the Smithsonian’s 1976 Festival of American Folklife, he was struck by the importance of cultural survival. He and his wife, Adolice (who like his mother also played the accordion), actively encouraged their two youngest sons, Virgil and Terry, to continue the Montoucet family tradition. Their group, Les Vagabonds, was one of the first young bands to take the stage at Lafayette’s Cajun Music Festival in 1976. His son-in-law Sammy Boudreaux has also been a part of the band over the years. Don has also generously shared his talent and culture with a number of aspiring young Cajun musicians. He had a special influence on Kevin Naquin, whom he and his wife babysat when Kevin was a child. It is in fact Kevin who had the idea to put together this opportunity for Don to have his own album. Don, Lionel and the Wandering Aces had recorded another album years ago for Sam Charters; it was released on Sonet Records in Europe, but has been nearly impossible to find here. Now we have this fine collection of songs representing Don Montoucet’s unique accordion stylings. He is ably supported by an all star crew featuring his son Terry and Kevin, as well as Jamey Bearb, Paul Fruge, Tommy Bodin, Louis Dronet, and Dwayne Lavergne. Any traditional music aficionado knows the story very well. A master musician has to find productive employment to support his family, music just won’t do. Don Montoucet worked as a master mechanic, plumber, carpenter, welder, blacksmith and school bus driver and played music in his free time for friends and family. Along the way he began to make the finest Cajun triangles in south Louisiana. His father and mother were both fine accordionists. His father even won an accordion contest beating such legendary players as Amede Ardoin and Joe Falcon. Don’s playing remained a casual sideline until he replaced the recently deceased accordionist Lawrence Walker in his band in 1973. He played out the scheduled engagements with the band and later teamed up with fiddlers Lionel Leleux to play festivals representing the 1950s’ Cajun dancehall style, This is his first American release. 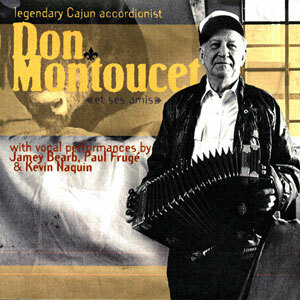 The CD is comprised of many Cajun classics and opens with the “Eunice Two Step.” Don’s influence upon the younger players such as Jimmy Breaux and Steve Riley is immediately evident. The strong dance beat and the combination of Don’s accordion and Louis Dronet’s fiddle makes the tune very appealing. Aldus Roger’s “Marie” follows featuring Don’s muscular accordion lead and Jamey Bearb’s fine vocals on this wonderful Cajun waltz. Iry LeJeune’s “Lacassine Special” is taken at a spirited two-step pace and “Les Flammes d’Enfer” from Austin Pitre benefits from Paul Fruge’s steel guitar. The “Amede Two Step” completes the CD, opening with the traditional trio of fiddle, accordion and triangle before morphing into a full dance hall romp. By the way, did I mention that Don Montoucet is 82 years old? He plays with all the energy of the young players he has influenced and it’s high time that this legendary Cajun accordionist gets recognized. Both of Don Montoucet’s parents played the accordion and, accordingly, he refers to himself as a purebred musician. Nonetheless, he only began playing publicly when he reached middle age after his friend, fiddler, Lionel Leleux, asked him to join the Wandering Aces as a replacement for the legendary Lawrence Walker, who died suddenly in 1973. With that group as back-up, Montoucet recorded an album that was produced by Sam Charters and released in 1979 on Sonet in Europe. Don Montoucet et ses Amis is his first recording since then. The musicians on the new recording provide a fuller sound, one that includes steel guitar, and the fact that there are three singers (Kevin Naquin, Jamey Bearb and Paul Fruge) makes for a fresher and more varied approach. “Allons a Lafayette” is the only song that is reprised from the earlier album, but Montoucet also draws from the traditional repertoire as well as from Aldus Roger, Iry Lejeune, Austin Pitre, Jo-El Sonnier and Marc Savoy. The sequel to Montoucet’s debut may have taken 28 years, but the passion and technical skill displayed will help Montoucet, an octogenarian, establish a stronger legacy for himself.